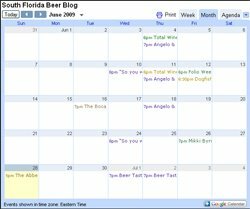 South Florida Beer Blog: South Florida Road Trip- Suggestions? I'm looking to take little road trip out of Miami and hit up some other beer spots around South Florida in Broward and Palm Counties. I know a few spots to hit but I'm wondering if anyone has any suggestions of places I should for sure check out. I'm looking for bars, breweries, beer stores or anything you think people should know about in South Florida. I think this trip will be happening on Friday so if anyone would want to meet up somewhere along the way let me know. Always like to meet people who are into beer. Leave your suggestions in the comments or you can also hit me up on Twitter and Facebook. The Boca Raton Beer Lovers Meetup Group is planning its first road trip for the end of July. We will be doing: Vine & Barley in Port St Lucie, Corner Cafe & Brewery in Tequesta, Yard House in Palm Beach Gardens, and either Brewwzzis in West Palm Beach, or the Coffee District in Delray Beach. Bus will leave and return to Case & Keg in Bqco Raton. Details are being finalized. All of these should be on your list. Our second road trip will go south and include Big Bear in Coral Springs, the Abbey in Miami Beach, Brother Tuckers in Pompano Beach. Have you been to Brother Tucker's in Deerfiels (Atlantic Ave?) They have an amazing selection of imported bottles and always have fine European stuff on draft. Hefeweisens, Trappist Beers, Wheaty wonders! It's an absolute MUST DO. And it doesn't hurt that their food is top notch!